Most applications I use allow users just to type dates in as DDMMYY to enter a date. This is easy for most people, but having a date picker is also nice for others. I have checked the default and the widgets and none seem to have this functionality, with most requiring the date picker to be used. One allows typing, but each part must go into distinct cells and there is no mask validation and so if I type 202 in the year this is accepted. Is there a date picker available that is just one date field and allows users to quickly type date (and validates it), but then also has the date picker calendar pop-up available for those who would prefer to use that? I think what you need was the DateTime field (found in Quick Tools) because it certainly fits the description you mentioned of a Date field. 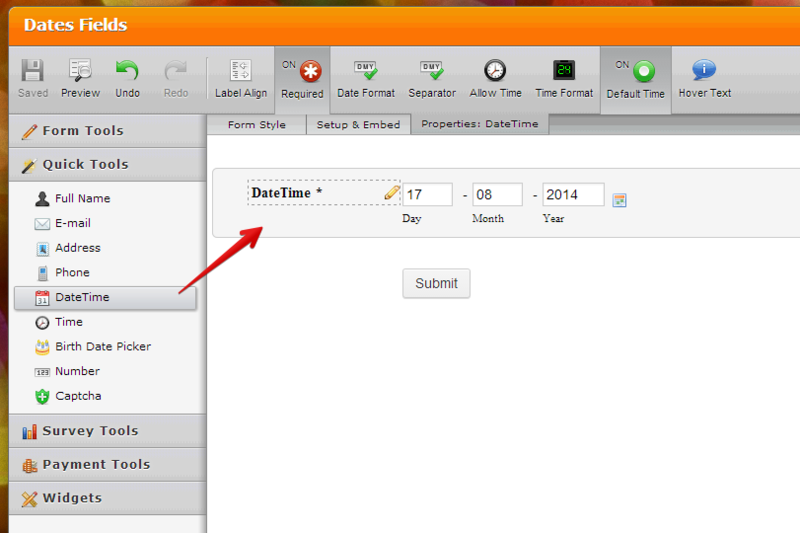 The DateTime field allows both Typing and Picker method of providing the data. Unfortunately, as you have mentioned already, there seems to be a bug in the field that allows invalid data when using the Typing method. I will submit a bug ticket report about the glitch in the DateTime field's lacking of validation action when data are being typed in. Hopefully when this is fixed, you can now use the DateTime field according to your requirements. We will notify you when we have update on the status of the ticket. Inform us also if you have further inquiry. Please note that 202 is a valid year. It's just not very recent. We will keep your suggestion in mind to adjust the user interface of the DateTime field, as we continue to make improvements to the product. We'll also consider adding the ability to limit the acceptable dates that users can select. This ticket will be updated if we implement those. typing in invalid dates directly into the input fields instead of using the DateTime picker. It's causing problems. Pls include ability to validate typed-in dates & time.